In April 2018, the tenants of Admiral and Dorsett Court apartments received not just any eviction notices, but fake ones. Owners of SBG Management thought they would try to flip the building for a profit. That was just the beginning of the attempts from SBG Management to illegally evict the 105-unit West Philly apartments. In mid-October, residents were told no one was permitted access to the building after 5 p.m. on Tuesday, October 30. Five o’clock came and went — and the residents stayed. “If people weren’t out here today, they would have locked this building,” Admiral Court tenant Shakevia Tisdale told The Philadelphia Partisan. SBG landlord Phillip Pulley and his property manager, Bill Hunter, didn’t show their faces with fifty tenants and supporters from the Philadelphia Tenants Union holding an eviction defense rally in the courtyard of the Admiral building. When interviewed by The Philadelphia Inquirer, an SBG lawyer claimed, “the reality is the owner can no longer sustain the debt on the building because the tenants are not paying.” But according to Community Legal Services, it was illegal for SBG to even collect rent in the first place. SBG didn’t have a rental license, due to the pile of violations it racked up on the buildings. The tenants didn’t know this until after they received eviction notices; at that point, they were encouraged by the Tenants Union to declare a rent strike. Despite the illegality of the eviction, the law is not stopping Pulley from selling the buildings for a massive profit. Gentrification means landlords can charge much higher rents to tenants with higher incomes who are moving into the neighborhood. Dozens of long-term Black residents are finding themselves displaced or homeless. This isn’t the first time SBG has profited from gentrification. The management company has a history of letting buildings deteriorate to the point where residents are without heat, without utilities, faced with fire hazards in apartments crumbling around them. As with Admiral and Dorsett, many of their properties are purchased from Friends Rehabilitation Program, Inc., a Quaker nonprofit that continually runs buildings like slums. SBG also sent fake eviction notices to residents at Fern Rock Gardens in the far north of the city. The company also has too many violations to acquire a rental license there. SBG also owns Squirrel Hill Falls Park in West Philadelphia, with its murals, fountain, and performance space, but has kept it closed to the public. In October of last year, a fire watch was established around the Dorsett building after it caught fire and smoke alarms failed to go off. Months earlier, SBG had been cited with fire code violations for faulty alarms, according to the city’s Department of Licenses and Inspections, but repairs were never made. Mold, mushrooms, rodents and disease were some of the cited complaints. Throughout the months that tenants held down the Admiral and Dorsett buildings, they faced knocks at all hours telling them to get out. Management shut off the water — nearly a dozen times. Locks were removed from the doors, leaving dangerous conditions for those in the building. Management then called the police on a union member who volunteered to reinstall locks for everyone. Bill Hunter later locked out tenants from their apartments, late at night in the freezing cold of November, according to residents. Management even allegedly trashed one tenant’s apartment and stole money from them. “The goons come out at night when nobody’s around,” Tisdale explained. Tenants repeatedly called the police, who would tell the property manager that evicting the tenants was illegal — but failed to ever issue a summons, despite clear physical and video evidence. The police once claimed they were powerless to take action since they hadn’t witnessed the illegal actions, despite arriving four hours after the initial call, tenants said. When the Tenants Union asked District Attorney Larry Krasner’s office if they would prosecute or stop the illegal eviction, they refused. Without their security deposits, tenants said in October that their families could not move. “A comparably sized unit would be an increase of at least $500 in rent,” Tisdale told the Partisan. Her family of four had gone without gas for six months, with urgent repairs not made. Together with the union, tenants pushed back against the bullying — they held a press conference, rallies, and a protest at SBG owner Philip Pulley’s suburban hockey rink, in addition to October’s emergency eviction defense. When whole buildings and neighborhoods are ruled by slumlords whose only goal is profit, communities cannot thrive. There were once children playing at Admiral and Dorsett Court apartments who would walk to the nearby Lea Elementary School. There were once wheelchair users, relieved to have found one of the few affordable buildings they could access. There were immigrants, settling into Philly and grateful to not be alone in their building. There was an elderly woman who felt so fortunate to be near her kidney dialysis center. 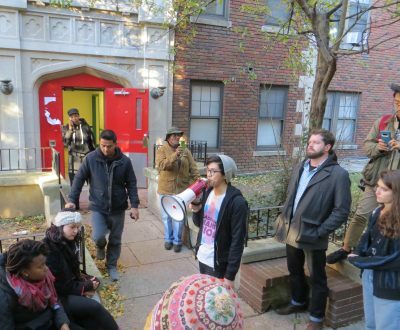 On November 30, tenants finally had to exit the building, under a court order. The few who stayed with nowhere else to go were locked out of their apartments only days after. Their furniture, belongings, and memories remained locked inside. SBG refused to let anyone back in to grab their things, leaving a few people starting over again without clothes or a toothbrush. As for the Tenants Union, they will continue to offer solidarity to anyone impacted by SBG Management.